Christmas bells are starting to sound all over the world and with those tinkles the excitement is building. Cities all over have hung up street-illuminations and stores are stocking up for the greatest shopping season of the year. The one question many of us face every year around this time is – stay home and celebrate with the extended family or travel with the kids to party in a foreign city? If you’re leaning towards traveling , here are three exciting Christmas destinations that capture the holiday spirit and offer a unique experience. 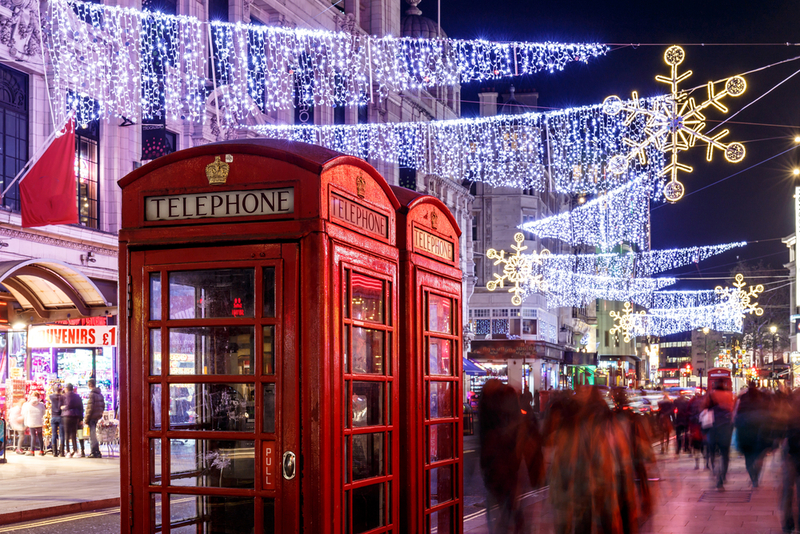 The elegance of London stays with it all year long, but during the holiday season the city embraces the festive look and offers a celebration to the eye – and feet! Ice skating is an English Christmas tradition that dates back to the 17th century, credited to King James II. Fast forward to now, London offers one the best ice skating experiences in Europe with gorgeous rinks all over the city. The famous Edmond J. Safra Fountain courtyard of the Somerset House is dressed in ice and open until the late hours with music to accompany your skating and lots of eats and drinks all around the rink. There are also two dedicated wheelchair sessions, on Wed 28 Nov and Sun 09 Dec, at 15.00. A grand historical setting for ice skating sessions with the ancient fortress looming on one side and the Thames on the other – an authentic London experience. We’re not ones to take sides, but this might be our favorite icy spot in London, if only for the enchanting live canopy of Christmas lights. It’s a very bright and colorful rink and there’s a very tall Christmas tree in the center of the rink – 30 feet high (!!). There’s no need to elaborate further on the age-old connection between Christmas and shopping. (Hey there, Santa!) If you’re into the Christmas scene, you’re probably into shopping and if so, then Winter Wonders is the one market you don’t want to miss. Over 200 stalls decorate the Grand Place in the center of Brussels with all types of imaginable Christmas treats – sweets and Belgian holiday delicacies (did someone say warm chocolate drizzled waffles? ), clothing and crafts (perfect for stocking fillers) and you have to try the Glühwein – traditional hot spiced wine. When you’ve had enough of browsing the market stalls, don’t forget to pay a visit to the massive Christmas tree and don’t miss the magical music and light show. There’s also a merry-go-round at Place Sainte-Catherine and a Ferris wheel and ice rink at Marché aux Poissons. Christmas in Jerusalem is the ultimate spiritual experience. The ancient city, soaked in history, takes on a unique vibe around Christmas time. With Jerusalem and the neighboring Bethlehem, it is less about shopping and light shows and more about celebrating the spirit of Christmas. Broadcasted live all over the world, this is the midnight mass, at the church built over the site believed to be the birthplace of Jesus Christ. It’s not the easiest ‘show’ to get hold of tickets to though, so the majority of the attending crowd watches from the grounds outside the church via screens in Manger Square. If you’re traveling with kids, of course, all kids love mass – little ones are known for adoring scripture 😉 – but you should probably let them blow off some steam as well, so they can sleep like the little angels they are. This event takes place in the courtyard of the College des Feres and the nearby Notre Dame hotel, there are clowns and of course a jolly Santa; a scouts parade; live shows and vibrant Christmas decorations and a lively market selling all kinds of gifts, toys, local foods and of course, spirits. Taking place early in the evening, you can follow in the footsteps of Jesus from his trial to the site of his crucifixion and burial at the Church of the Holy Sepulchre, walking the Via Dolorosa in the Old City of Jerusalem. After midnight mass at the Church of the Holy Sepulchre, you may want to take part in the Latin Patriarch’s Procession from the Old City, passing the Mar Elias Monastery and reaching the Church of Nativity in Bethlehem at around 1 AM. If you’re less into walking (or you have little ones who can’t walk too far) you can join in the Christmas caroling at the Benedectine Church of the Dormition on Mount Zion. When you’re energized enough from the singing, you can join the procession to Bethlehem at 2:30am. *Next week we’ll share three more exciting Christmas destinations, so stay tuned!